Smartphone wars, browser wars, and now here comes the search engine war. Running for quiet sometime but not much of a breaking topic as none of the search engines could over come the internet search giant Google, neither has anyone now. But something dearly happened as Microsoft’s search engine ‘Bing’ claimed a victory today over Yahoo, the much older and experienced. After claiming a clear victory over Yahoo, Bing would now be classed as No.2. Bing’s climb would also grab a nice number of advertisers share which would obviously affect Google too. 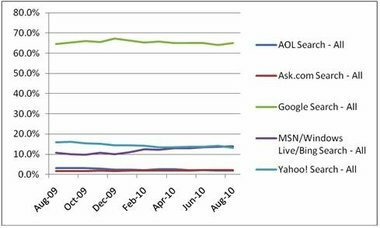 The latest search statistics reveal that Yahoo is out of the way and now the only competitor left for Bing would be Google. The new figures reveal that Bing shares a 13.9 percent of all search share as Yahoo fell to 13.1 percent while Google dominates the search podium with 65.1 percent. While a growth was administered by Bing, it still needs to keep an eagle eye on Google. The internet search giant recently unveiled the latest feature known as Google Instant to bring search results as you type. The search results from Google are surely not to compare as it displays the perfect result without any mistakes. Google also has a strong grip on mobile searches as it is displayed as the default search engine for iPhone and Android. Microsoft needs to notice this climb and would need to integrate the same process with Windows Phone. Looking individually, Bing has climbed but the search deal between Microsoft and Yahoo if combined would represent a total share of 26 percent. Good news for the Microsoft team i guess. By the way, the margin between Google and Others are huge, more than 50%! Do Agree…But the only thing to point out was…Yahoo no longer the second best..
Wow look at AOL search! They are doing great.